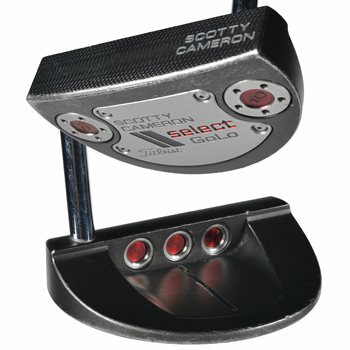 The Titleist Scotty Cameron Select GoLo putters are CNC precision milled of 303 stainless steel and feature an elegant rounded profile and racy soleplate with Select weighting technology for modern balance and stability. The slightly asymmetric back profile, contained cavity lines, and pulled in heel encourage a flowing stroke along the ideal arc. The deep milled face provides a soft feel and sound while the tour-validated Black Mist finish combined with the red-dot graphics create a modern but timeless look. 3/4 shaft offset with single bend neck. No, this would have toe hang and not be a face balanced design. There are GoLo models that are closer to face balanced.